Salamis Filoxenia will take you to both new and popular destinations, offering, as always, unparalleled hospitality and first class service. Prepare for new memories and experiences, relaxation… and enjoyment! Leave the routine of everyday life behind you, the journey is about to begin. 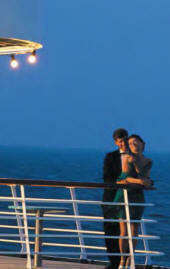 Enjoy in comfort and luxury, the most beautiful get away from it all cruise full of cherished moments. Relax with a drink while the breeze of the Mediterranean keeps you company. Enjoy your drink and feel the Mediterranean breeze filling you with magic at sunset by either the Pool bar or the Messogios bar. Enjoy a romantic walk with a view of the Mediterranean on the vessel's open deck. Restaurant: The Symposium Restaurant offers the best in international and local cuisine from our experienced chef and his team. From freshly cooked bread to delicious desserts everything is made on board, daily with artistry and care, using fine products. Enjoy a rich breakfast, splendid meals and diners that will satisfy the most demanding passenger, for their quality, variety and taste. In the ship’s lounges you can order from the rich A la Carte Menu. Room Service is also available 24 hours per day. Playroom: The c/s Salamis Filoxenia offers for our little friends an additional opportunity. In the Playroom they can have fun, safely and under the supervision of specialised personnel. Internet corner: Those who can’t live without technology can visit our Internet Centre which is open during almost the whole duration of the cruise. Pools: There are two pools available for both adults and children. Enjoy sunbathing on sun beds and try a snack and a drink from the Pool Bar. Fitness Room: Whether you are interested in working out or improving your well being, our Fitness Room situated on the Atlas Deck, is there to make your stay even more pleasant. Travel shop: This is the place for smart deals on a great variety of products. The price are simply amazing. The entertainment does not stop for a second. Captain's club: At the Captain’s Club you may enjoy your drink anytime or to the accompaniment of piano starting early in the evening. Sky Bar: At the Sky Bar, coffee lovers will find the time to relax and let their senses take them on a journey while enjoying the panoramic view. We continue later at night with music and dancing under the stars. Pool bar: Enjoy your drink with company and the fresh sea air and feel the Mediterranean breeze filling you with magic at the sunset by the Pool bar and the Messogios bar. Casino: You may also visit the casino and try your luck. Who knows, it might favour you. Cinema: At the c/s Salamis Filoxenia cinema you may watch some great movies and also "can be used for lectures and seminars". If you want to add a touch of extra luxury you can select one of our luxurious and spacious suites with mini-bar, TV and video. The hospitality of the trained staff, as well as the unique facilities and comforts offered by the Salamis Filoxenia, are good reasons to make this Mini-Cruise a thoroughly enjoyable and unforgettable experience.